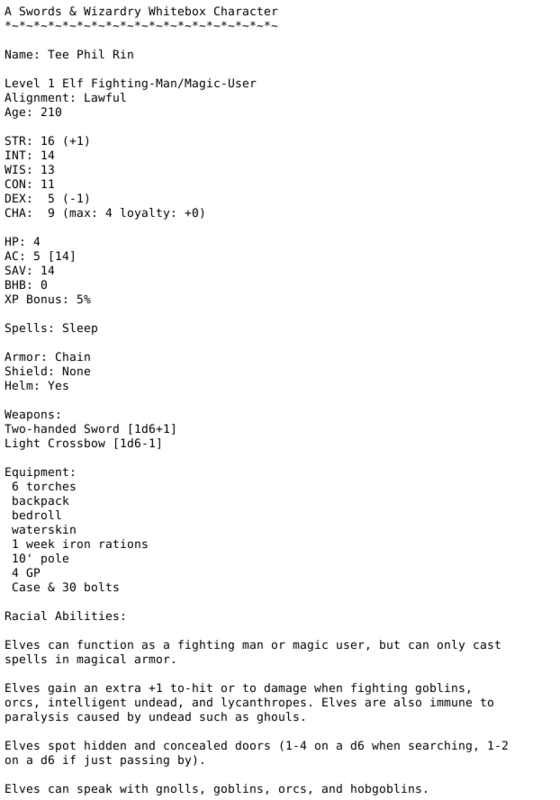 I’ve made a random character generator for S&W Whitebox, one of my favorite retro-clones. The output is text-only for now, and will give you a new, random level one character each time you reload the page. It will handle the Whitebox universal attribute bonus, as well as the XP bonus, armor class (both ascending and descending), and weapon damage. Let me know if you see any errors or have an idea that would make it more useful. Thanks to Untimately for the equipment lists and Zenopus Archives for the Holmesian random names. Great stuff, thanks for making this! OMG! Gopher! My friend developed Gopher. As in _the_ developer of Gopher? Cool! It’s really a nice protocol for sharing text documents. Very fast and simple. Not really practical nowadays, of course, but fun to play with nonetheless.